Combine the flavors of Italy with the heart of the Irish, add some Chicago flare and you've got Gallagher's Pizza! For the best Chicago style pizza north of the Illinois border, Gallagher's pizza is your destination. 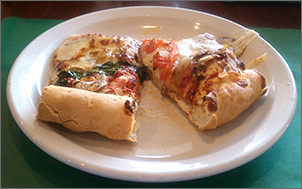 Served any way you like it - thin crust, hand tossed, deep dish, or stuffed - there's something for everyone. Everything on the menu is made fresh daily from the Italian Beef sandwiches and salads, to chicken dinners and pizza - we make the crust and sauce - we do it all. Got their Veggie Pizza and wow, it was pretty darn tasty. It had onions, mushrooms, peppers and a slice of tomato was on every cut piece. Incredible. 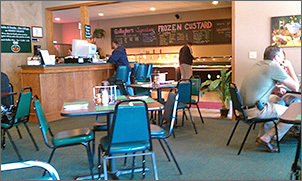 I stopped in for lunch at Gallagher's Pizza East for a quick lunch; they are located in East Green Bay close to the Allouez border. Gallagher's is a very low key casual restaurant with booths and tables to the left side and on the right side is where they have a large buffet area set up. In the center of the room is a counter and register with hostess stand. The carpeting is green as are the vinyl seat chairs with bright green paper placemats on all the tables with silverware rolled in paper napkins. There are a couple of flat screen TVs and silk green plants hanging above in the dining area with colorful cartoon type chefs adorning the walls. In the background disco music from the 70's was playing in the background. The buffet looked like it was the popular way to go, in fact the waitress told me I could just go help myself assuming that I would not look or order from the menu. The buffet cost $6.99 for all you can eat and they had quite a variety ; a nice salad bar containing iceberg lettuce with a good choice of toppings, pastas, fried chicken, shredded roast beef with buns, two soups, breadsticks, and four types of pizzas. I was mainly interested in trying the pizza since that is what they specialize in. I decided to try the pepperoni pizza and their spinach pizza. The crusts on both were thick and on both pizzas the pepperoni and the spinach are placed under a very thick layer of mozzarella cheese. Both pizzas had a very good flavor for the mozzarella cheese was of good quality. Gallagher's service was adequate and at times lax for I ordered ice water and had to get her attention later since she had forgotten it. Gallagher's also has a large menu with sandwiches and different pastas.